If you were hoping for some messed up concoction of a cake consisting of lamb meat, I'm sorry to disappoint you (no, I'm actually not. That sounds disgusting, and I hope it doesn't exist anywhere in this world). Nope, I just figured I'd brighten everyone's day at the end of the week with a cake shaped like a lamb that I thought was just toooooo kyoot to pass up a chance to take a photo of (my inner 8 year old girl demanded I do so). I didn't buy it, so I can't comment on how it tasted (it was only 200 NT which is like $6... maybe I should've bought it), but I have to say the craftsmanship was exquisite. 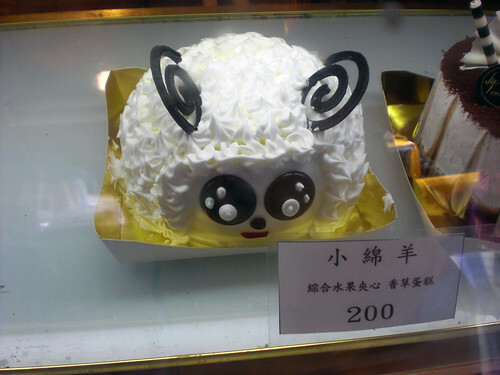 If you remember, they also make panda's shaped like cakes. This is slightly less awesome. I like pandas way more than sheep. Anyhoo, hope everyone else enjoyed this as much as I did... which is unlikely because I'm childish. hehe gotta love the animal face cakes! have yet to see a lamb one, i am always seeing piggies! i see a lot of spongebob cakes for some reason, but they all look kind of demented in some way or another. and yes please to food! i think i use eating as a means to kill my boredom since i'm probably unemployed this summer haha. haha yeah, understandable. so easy to go broke in taiwan even though everything is relatively cheaper, but ahhh so much good food everywhere! my meager 1hr/week tutoring job salary goes straight to food. anyhow, how should i contact you?